Anne Fernald, a psychologist and Stanford professor of human biology, says that the number of words a child hears between 0 and 4 is the greatest predictor of their success in life. The greatest. It was this research which inspired Nicki Boyd to tap into this potential with her two VersaMe co-founders, Jon and Chris Boggiano. Starling looks fun and simple enough. 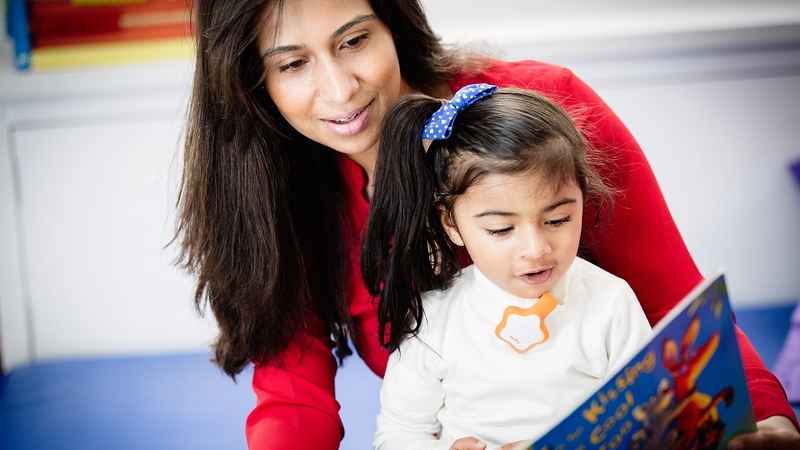 The wearable for young children was successfully funded by 500 backers on Indiegogo last October. It's in the final stages of manufacturing in Shenzhen, and on sale now for $199 with shipping as soon as August. But there's three decades of research into language development behind it. The more language children are exposed to before they turn 4, the better their chances of success in later life. And that's largely because an incredible 80% of brain development occurs in that early period. So what does that have to do with wearable tech? Starling's built-in mic tracks how many words a child hears or speaks throughout the day, records the meta data (not the audio) of the quantity of words and processes it on the wearable itself. The companion app lets parents set and work towards daily targets (between around 8,000 to 20,000) with an LED light to glow green when they get there. Daily activity reminders in the app also encourage them to talk more and gaze silently at their phones and iPads less. "We're trying to recognise that parents are busy and take advantage of these micro moments. So you might already be changing a nappy and you're at this optimal distance of engaging with your child of 18 inches. Talk about a story when you were young, or the trip to the supermarket this morning." Boyd doesn't want to give away exactly how the system works as VersaMe has two patents pending and was in stealth mode until the Indiegogo campaign. But the team has tested the system on seven, structurally different languages and is yet to come across a user who has reported that Starling doesn't work with their language. As there is no recording of the audio, the focus of the first gen device is on the quantity of words a child hears. That said, the startup has a data science team working on advanced features and Boyd, who heads up the operations team, says that with better microprocessors and power management, future versions of the Starling could go further. "Quality means variety, length of sentence and conversational turns which is the back and forth between a child and a parent," she says. "But the reality is that research says quality is almost perfectly correlated with quantity. So if we encourage you to say more, the reality is - you don't sit there and say 'Dog, dog, dog, dog.' There's an implicit assumption that they go hand in hand." There will inevitably be comparisons made with other friends with kids but Boyd says the last thing they want to do is make new parents, especially first time parents, feel more overwhelmed. So the emphasis is on beating your own daily word targets and seeing progress in a matter of weeks. "Parents are stressed, they're busy, they feel judged, we don't want this to be another thing that makes them feel like a failure," says the co-founder. "We try to make it individual and much more about the self and your investment in your child. For a first child, in particular, you want to know what you can do to make sure your kid is the next Einstein." VersaMe has also come across some accidental use cases when talking to speech therapists and paediatricians who are interested in the product. A school for deaf children in California is also sending Starlings to parents of kids who have had cochlear hearing implants and are behind on language development. Alongside retail plans for dedicated baby stores later this year, Boyd has big ideas for partnerships to get Starling to disadvantaged kids in the US and UK and level out that language development playing field: "What would be amazing is for every new parent to leave the hospital with one of these."